This is going to be a long one though, so you might want to get a sandwich, a soda, and your favorite brushable pony. We'll be sending out invoices very soon! We'll also send out an email before the invoices that mainly just goes over what's here again for everyone that doesn't regularly check here. 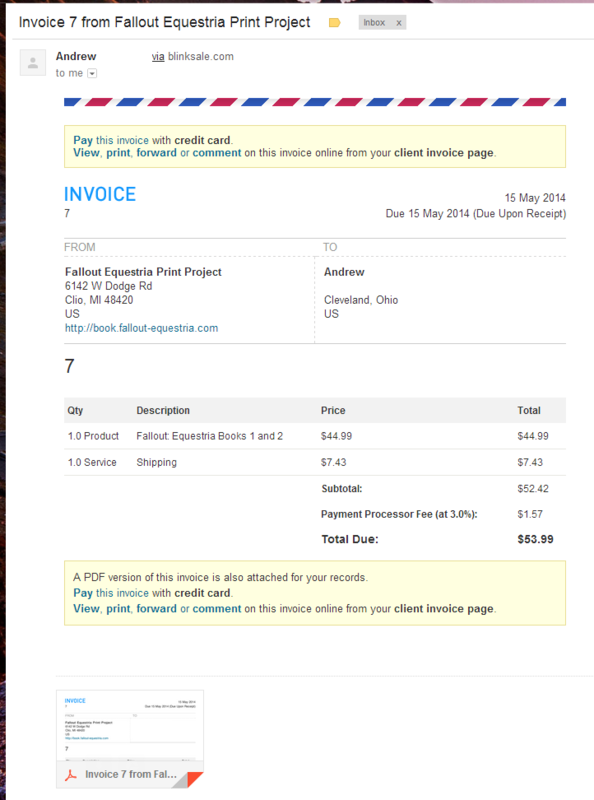 Edit: We sent out invoices to everyone early in the morning May 17th (EDT, GMT-0400). Shortly before invoices were processed, you should've received an info email. 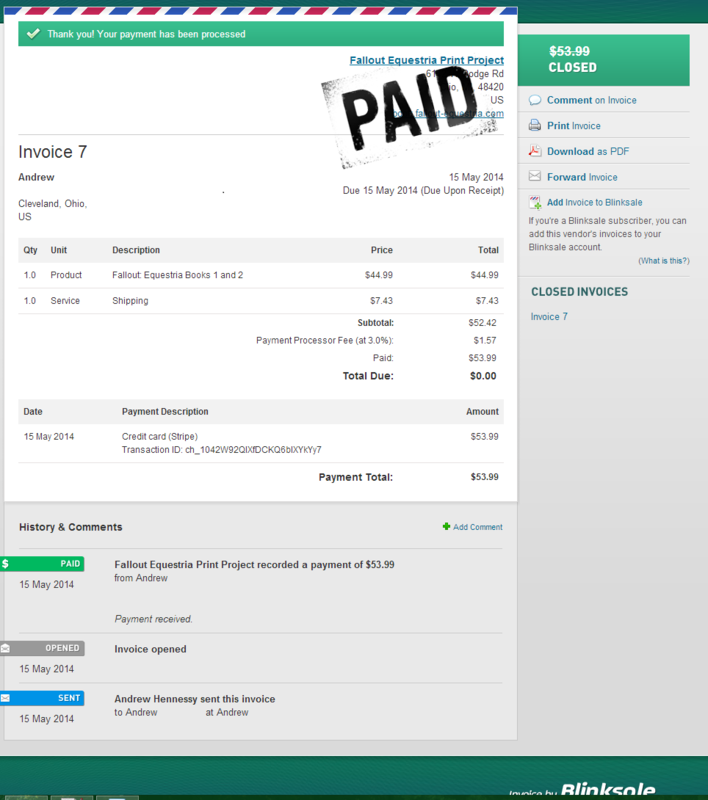 Edit 2: As of like the 19th, all invoices have been sent out. If you didn't get your, just shoot us an email at FOEPrintProject@gmail.com and we'll figure out what's up. Edit 3: hotmail/live/outlook/whatever is a bit overzealous with the spam filtering. 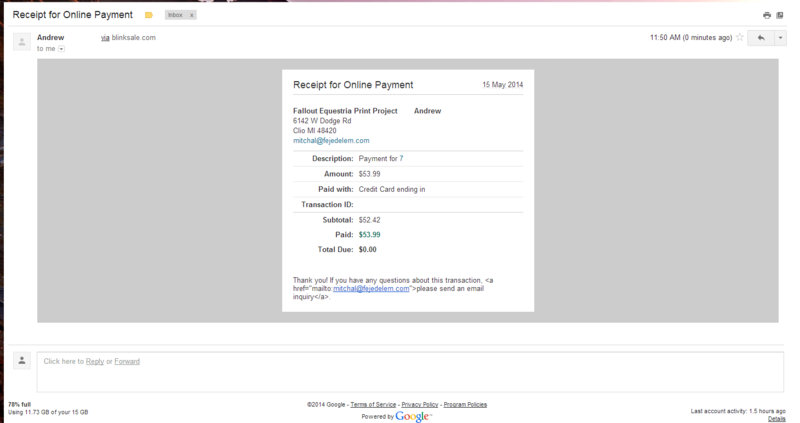 If you still don't have your invoice, check your spam folder before emailing us. Edit 4: Around midnight on May 21st (EDT, GMT-0400), we sent out a reminder email to the ~200 people who still have not paid. Edit 5: I really should just make a new post. On May 26th, between 1200 and 1700 (EDT, GMT-0400), all 127 past-due invoices were deleted. If you click your invoice and get a 404 page, it's because you missed the deadline. Sorry. The books are $44.99 per set. International should be around $100. The rest of this is just to clarify a couple of things about how everything is going to go down from here. Especially with one of the main questions we keep getting about this, so let's start clearing everything up, shall we? When are the books going to be shipped to you? That, my friend, depends entirely on you and your fellow signers and how fast we're able to get all the payments in. Simply put, we do not have the books on hand to be able to ship them out as soon as we get the costs covered to make and ship them. We're not Discord. We can't just snap our clawed fingers and magically have a brand new copy of Fallout Equestria ready and waiting for you. It would be nice if we could do that. It would also be nice to make it rain chocolate, but the real world doesn't work like that. The printing itself is going to take 5 to 6 weeks. Please note that this is not after the initial quote is given, and we send the printer the final files. Life, unfortunately, does not work like that. Printing of the books will start only after the printer has received the cleared payment. Those two points cannot be stressed enough. Printing the books will take 5 to 6 weeks and will only start after the printer has received the cleared payment. So, when are the books going to be shipped to you? The books will be shipped out to everyone who has signed approximately 7 to 8 weeks after all payments have been collected from every signer. That is of course, assuming that nothing goes wrong during that time frame. If something does, you will be notified immediately that the schedule has been changed. 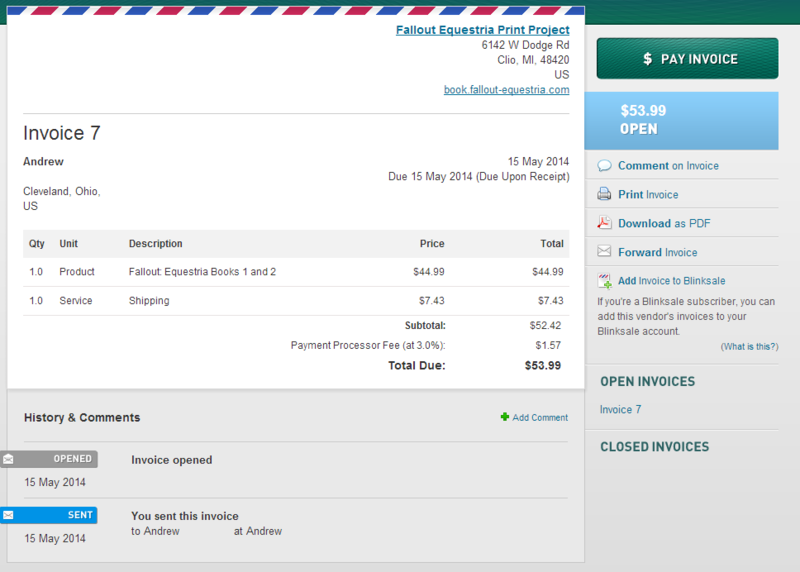 How soon will the printer get the payment? The short answer: as soon as possible. The long answer: that depends on how fast we receive all the payments. 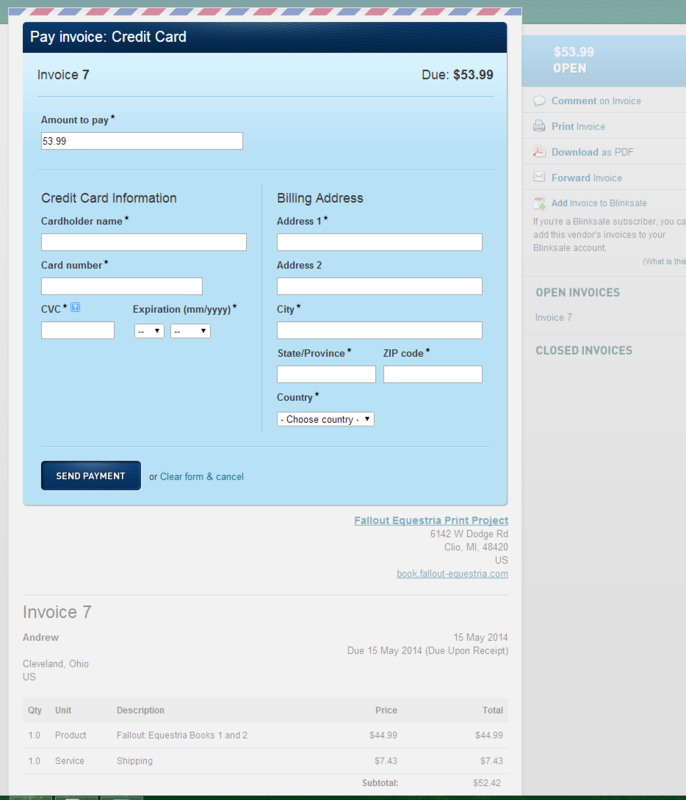 Ideally, we would love to send in the payment no more than one week after sending out all the invoices. Will that work? Discord only knows, but I would like to think so. When are the payment due? Realistically, we would like to have payment due upon receipt of the invoice. However, we know that isn't going to happen for everyone. Unexpected expenses come up; payday isn't until next week; etc. We understand that money is trouble. However, we also need you signers to understand that the speed at which this project moves is based entirely on how quickly we get the total payment amount in. So this is how it is going to work. For those signers on the main list, payment is due May 25th. If after the 25th payment has not been received, your invoice will be canceled, you will be removed from the main list, and your spot will be filled by the next person in line on the waitlist. For those signers who get moved from the waitlist to the main list after the initial invoices go out, payment is due one week after the send date of the invoice. Again, if payment hasn't been received after the week has passed, your invoice will be canceled and you will be removed from the list. As to what would happen at that point? We would keep going through the waitlist until all orders had been filled and paid for. If we somehow go through the entire waitlist and still haven't filled the entire order, we have a contingency for that. What is the contingency plan if the order is not filled? That will be revealed if, and if only if, there becomes a need for it. How will I know that my order is ready to ship? Thankfully, our distributor makes this incredibly easy. You will receive an e-mail notification from them with your tracking number when your books are shipped. If you live in the US, you will receive a USPS tracking number. Outside of the US, unfortunately, it will not be possible. International tracking hasn't been set up to be feasible, but we'll make sure you know when your order has been shipped. I've moved or am in the process of moving, or will expect to have moved by the time comes for shipping. Are you guys going to be able handle a change in address? The answer to this question is yes. However, we must be informed about the address change ASAP otherwise your books will be sent to the address we have listed in our database. We are not mindreaders, nor are we clairvoyant. If you move, you have to give us a heads up, otherwise your book will be sent to your previous address. If you're unsure what address you gave, it will be listed on your invoice. That's really all we have to say for now. Keep checking back here, this is where we'll post news as it comes in, or if you want to chat with us, swing by the IRC channel. For those confused by the process I have written up a quick tutorial on how to throw money at your screen. This is important. The “To” address is where we will ship your books to. If this is wrong do not pay the invoice. Send an email to FOEPrintProject@gmail.com with the updated address. Do not post in the forums. Do not send us a private message. Send an email to the address. I lol'd at seeing "Cleveland Ohio" as part of the tutorial... (I live in Ohio!). Anyways... It's like 2AM in the morning so won't be paying right now obviously but will be paying it hopefully "later today" (if things goes well). If not, on Monday. (can't do it on Sunday obviously, I think ). Boom! Done. I hope this part goes smoothly for everyone so we can get the books as soon as possible. So excited!